If your stairs are carpeted, chances are you’ve looked at them before and thought that you needed to get a specific vacuum cleaner for stairs. It’s no secret that they see a lot of traffic and pick up a lot of debris. That’s why we’ve put together this handy buying guide: to help you choose one! Before we get started looking at our vacuum choices, here are some things you need to know! Type: There are a few different types of vacuums that might work for stairs. Handheld vacuums are small and portable, while stick vacuums give you more reach. Upright vacuums are full-sized machines with greater power and suction! HEPA Filter: A HEPA filter is a part of a sophisticated suctioning system which filters all of the dust and dirt out of the air that is cycling back into your home. They are usually washable and have a long lifespan. Power: The vacuums on this list will either be cordless or corded. The cordless ones can be charged and taken all over the house, while the corded ones provide consistent power that is somewhat limited by the cord. Bagless: Most of the vacuums featured here will be bagless, which mean that they have a dirt cup that needs to be emptied rather than replacing a whole bag. This is useful for quick, sanitary cleaning. Weight: The weight of the vacuum could determine whether you can personally use it on your stairs. Some of these vacuums are definitely heavier than others, so you will have to choose based on personal preference. Warranty: The warranty protects both you and your purchase from any defects in the manufacturing. This means that if something breaks during normal wear or use, you can get a refund or replacement during the warranty period. That’s all you need to know about stair vacuums! Now we can show you our choices. Our top pick and budget pick are the creams of the crop, so take a look at those first before moving on to the rest of the list. There are a lot of fine home cleaning products to explore here. We’re sure you’ll find yours, so let’s get started with the stair vacuum reviews! Our choice for the best vacuum cleaner for stairs is the Shark Navigator Upright. It’s a full-powered machine with powerful suction and complete anti-allergen seal technology. This means that when air circulates through the vacuum, it traps 99.9% of dust and dirt inside the machine so that they don’t re-enter your air supply. 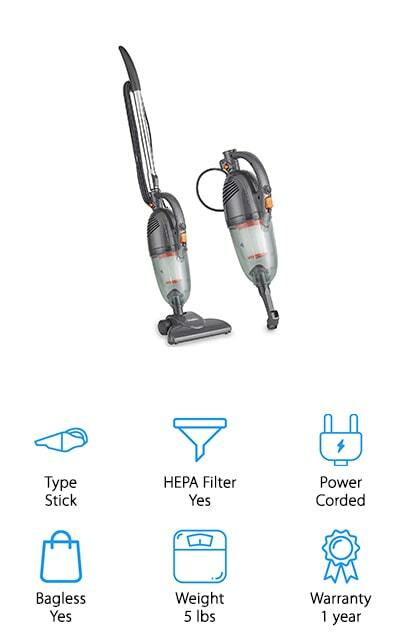 Pair this with lift-away technology that allows you to quickly and easily get the dirt canister off to clean it, and it’s easy to see why this vacuum made it to the top of our list. It comes with a crevice tool (perfect for stairs!) as well as a dusting brush and a pet power brush to help get that pesky pet hair off of your carpet. When you’re using it as an upright vacuum, the swivel steering makes it easy to move around furniture rather than moving it every time. The large dust cup means that you can do your entire staircase before emptying! For the best handheld vacuum for stairs, we went with the Bissell Pet Hair Vacuum. It’s got a powerful 4-amp motor that will quickly bust through all of the dirt and hair on your stairs. It’s got a 16-foot power cord, so you can get your staircase without having to move the plug. That’s always a bonus! It’s got a larger-than-average dirt cup so you can go for longer without having to empty it. One of the reasons this vacuum works so well for pet hair is the special rubber nozzle that helps to attract any hair it rolls over and gets the dirt out of those deep places, to help your carpeted stairs look and feel better! 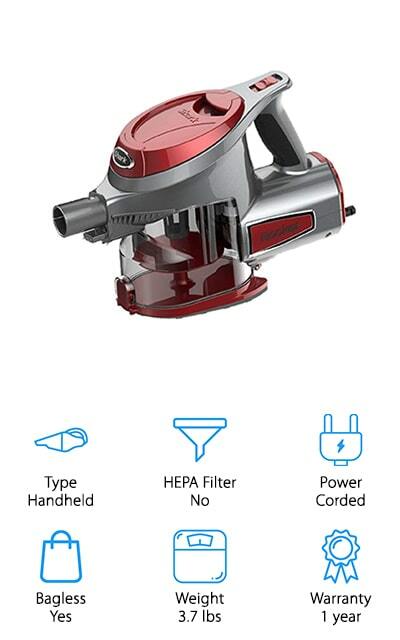 The hand vacuum uses a multi-layer filtration system to help keep allergens out of the air when it cycles through. 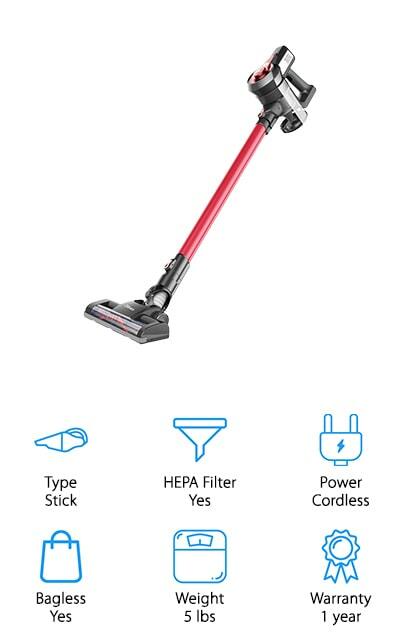 With all of the attachments and an affordable price, this is a neat little hand vacuum cleaner for stairs! Dyson is a well-known name in vacuum cleaning machines, and that’s what landed their V6 Cordless on our list. It’s cordless, which means that it can run for up to 20 minutes continuously on a full charge. The trigger releases instantly, making it easy to use! One of the coolest features is that the battery only discharges when it’s cleaning, which is very responsible. Plus, it’s ergonomically designed so that it’s comfortable to get your stairs clean. it comes with a motorized cleaning head for all different types of floors, as well as a nylon bristle head that will get the ground-in dirt out of the recesses of your carpet. 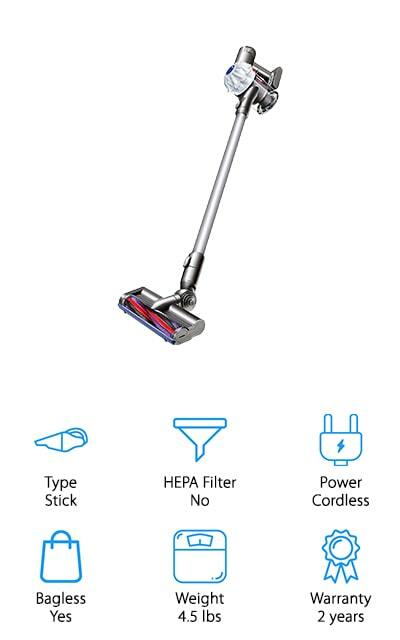 On this last head, there are bristles running the entire length of the head of the vacuum, so you can definitely clean every edge of your stairs. 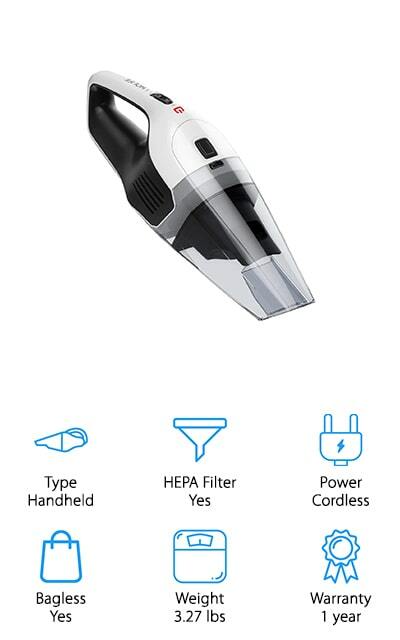 It really is the perfect handheld vacuum cleaner - perfect for cleaning every inch of your home! You’re going to love it! The Shark Rocket is one of the best vacuums for cleaning stairs because of how lightweight it is. It comes with a 15-foot power cord for reaching even the highest steps. The dust cup is easy to empty and will dump out with the simple press of a button and nothing more. Now it’s easier than ever to empty the cup between stretches of vacuuming. 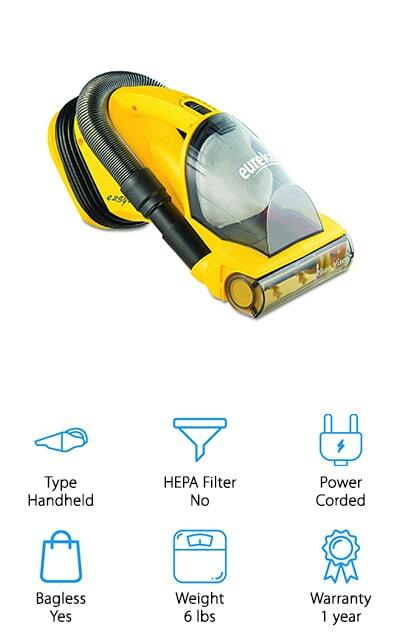 It gives you plenty of powerful cleaning without ever losing suction. There’s a miniature motorized brush that’s perfect for getting all of the dirt, dust, and other nasty things out of your upholstery and carpet, so you can be sure that you’re getting the best clean each and every time. We love how portable it is and how dedicated it is to get all of the ground-in and set-in dirt out of the depths of your carpet - especially on high-traffic stairs. It can really make a difference, and we know you’ll see that as well! Dibea makes this stick vacuum that will clean your stairs expertly. It has a rotating cleaning head that allows you to clean edges and areas close to walls easier. It also helps this vacuum get under furniture you won’t want to have to move. It comes with a crevice tool as well as a stiff brush that will help lift all of the ground-in dirt out of your carpet and other hard-to-reach areas. This is really useful on your stairs! This vacuum only weighs about five pounds, and it’s cordless as well. This makes it really easy to clean the steps without having to worry about the cord. There are two different speeds for suction, which is great for different types of cleanups. The MAX mode is perfect for carpet, and you’ll want to use it for your carpeted stairs as well. The dirt cup is easy to empty without ever touching the debris inside. It’s simple and powerful. The Eureka EasyClean is a great vacuum cleaner for stairs. It’s handheld and extremely portable, which makes it great for any work that’s not close to a power outlet. The 20-foot cord will help you easily clean the space that needs it and does so without changing plugs. It weighs less than five pounds, so it will be comfortable for you to carry anywhere! It comes with a motorized brush that you can turn on and off, which will help you easily clean the carpeted areas of your home. The dust canister is easy to empty, and it’s large enough that you won’t be emptying it every few moments. The brush and the suction feature have different motors. This ensures that you’re getting the best clean that you possibly can, with enough power to get all of the dirt out of your carpets. This vacuum is a perfect size and weight for your stairs, even with a cord! Dirt Devil has earned a place on our list with decades of reliable vacuum cleaning machines. This one is definitely a star on their lineup! It’s got a high-speed brush roll that will help to clean up just about any mess no matter what size. It’s an extremely light vacuum. At only 2.8 pounds, it’s easy to move this thing around wherever you need it. You can do the entire staircase in one go with the 20-foot power cord. And you don’t have to worry about what you’re going to do with that cord, because it has integrated storage so you can keep it tidy even when you aren’t using it. You can clean all the parts of your room without unplugging. The filter can be rinsed and reused so you won’t have to replace it too often! The dirt cup can even be emptied with a single button, so it’s simple and you won’t have to touch it! VonHaus makes one of the best vacuums for carpeted stairs on our list. 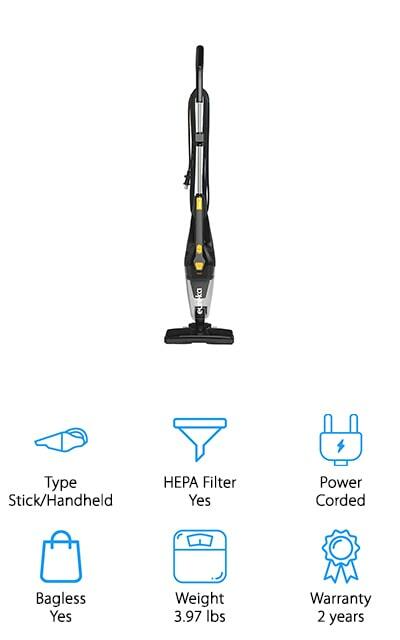 It’s a stick vacuum initially, but it disconnects into a handheld without the extension tube, which allows you a much lighter and more maneuverable cleaner. Both versions have 5.5 amps of incredible suction power. The dust cup has a full 1.3-liter capacity so you can go longer without having to empty it. You only have to remove it and empty it right into the trash, so it’s simple as well. 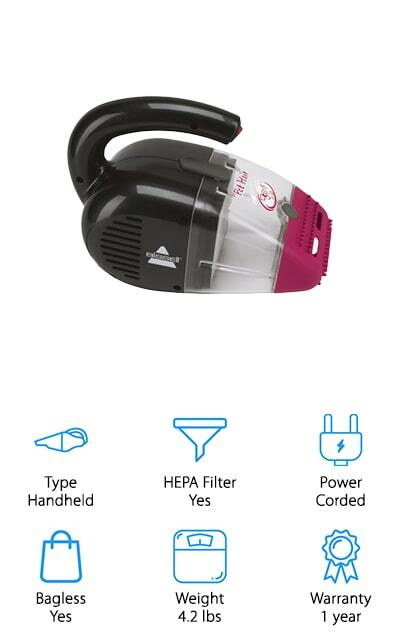 It uses washable HEPA filters, so you won’t have to replace it often. It’s great for hardwood floors as well, so this vacuum will be great for you even if you don’t have carpet. The 19.5-foot power cord is a great feature, as well as the included crevice tool and brush attachment. Together, combined with both vacuuming options and shoulder strap, these things definitely help to put VonHaus on our list! HoLife makes one of the best cordless vacuums for stairs on our list because it’s got a short charge time with a long battery life. It includes a high-powered motor that gives the machine strong enough suction to get your floors super clean, no matter if they’re carpeted or hardwood or anything in between. It’ll pick up some amazingly small particles of dust and debris! The battery will last for a full thirty minutes on a full charge, which is pretty amazing when you consider that it only needs 45 minutes to completely charge. The dust cup is large enough to only empty once you’re done with your vacuuming. 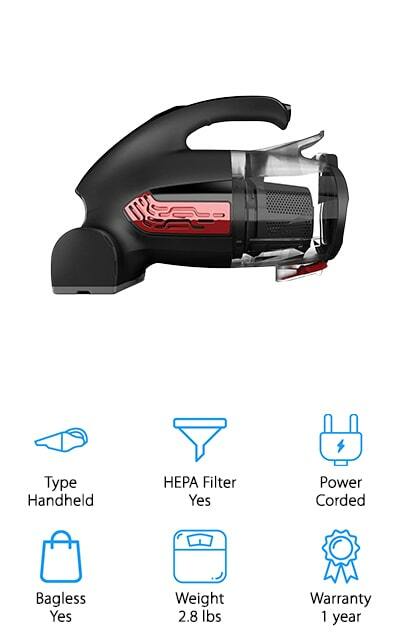 What makes this vacuum amazing is all of the technology to help improve and promote battery life and safety. 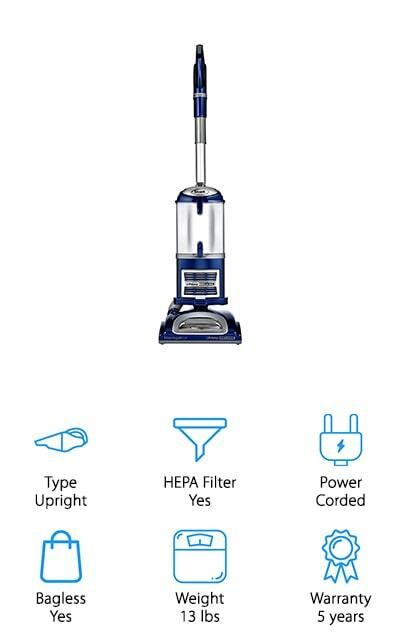 This allows you to get the most out of your vacuum and allowing it to stay your constant cleaning companion for many years to come! Your floors will thank you! The Eureka Blaze won a spot on our list through the use of an onboard crevice tool. It’s easy to customize and make into the vacuum that you use, all the way from a stick straight to a handheld. It includes the great steering that Eureka is known for, which makes it easier to clean with. You can easily move around all the edges of your furniture easily. The nozzle picks up debris that’s both large and small with ease. It’s backed by a powerful motor that will help keep the suction consistent and perfect for cleaning up your home, from the sofa to the stairs. The power cord is a full 18-inches long, and the dust cup is extra-large to give you more room and time to clean to your heart’s content. You won’t take too long moving from outlet to outlet or taking extra trips to the garbage can to dump the debris!